At Chaska Dental Center, Dr. Meschke and Dr. Swingdorf encourage patients to live healthy lifestyles. 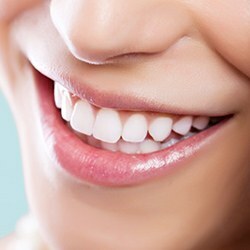 A strong smile is a key component to lasting overall wellness, and studies show that dental disease contributes to a host of whole-body health complications, including heart attack, stroke, respiratory problems, osteoporosis, and even Alzheimer’s disease. We seek to preserve smiles and encourage optimal oral health. Our dentists use only natural-looking, biocompatible materials to restore and replace damaged and missing teeth. We design and place tooth-colored fillings, dental implant restorations, and provide CEREC one-visit crowns that can improve dental function and appearance and deliver outstanding durability. No matter the complexity of your dental needs, we’ll renew your smile with precision, skill, and a focus on your comfort and satisfaction. 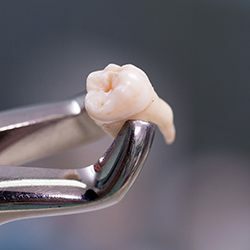 A crown is a tooth-shaped “cap” that simply fits over the top of a damaged tooth, and it can be used to restore a tooth to its original function and form at the same time. They can be made of a variety of materials, put our practice prefers to use natural-looking all-porcelain crowns whenever we can. We can even use two of them together to form a bridge to replace a single missing tooth or a few in a row. The restorations often end up looking so natural that sometimes even our dentists can’t even tell them apart from real teeth! Thanks to tooth-colored composite resin-fillings, we can now fully restore a tooth with a small cavity or a slight amount of damage without altering its appearance. 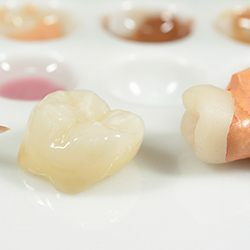 The composite resin can be specially shaded to completely blend in with your tooth, plus the material also forms a much stronger bond with the enamel compared to a traditional silver filling, enabling your dentist to be more conservative and keep more of your tooth intact while placing the filling. In the end, you get a tooth that looks great and is built to last. Traditionally, if you wanted to have a tooth repaired with a crown, it would take at least two visits to a dentist’s office spaced about a week apart. In today’s society, that is simply too slow, which is why we’re happy to offer CEREC® 1-Visit Restorations. 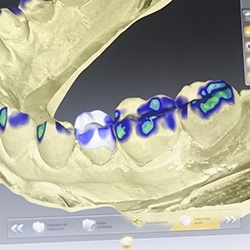 With this advanced technology, we can literally design, fabricate, and place a completely custom-made all-porcelain dental crown in just a single visit. 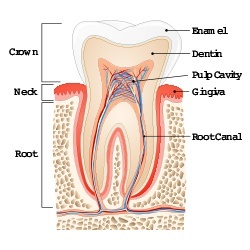 Every tooth actually has a small bit of soft tissue inside it called the dental pulp, and whether due to an injury or decay, this tissue can sometimes become infected, which can lead to the mother of all toothaches. To relieve this pain, our doctors can remove the tissue with root canal therapy. Dr. Swingdorf enjoys doing root canals because it allows him to relieve a patient’s pain and save teeth that would otherwise need to be removed. In any case, we’ll use a gentle touch and a generous amount of local anesthesia to make sure if you need an extraction, you’ll be comfortable the entire time. Multiple missing teeth can cause all kinds of problems when it comes to both your appearance and dental health, but with dentures, we can quickly restore your smile’s look and function. 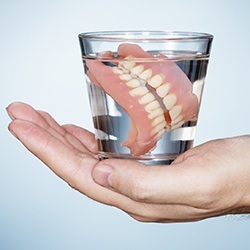 Thanks to the latest advancements in dental prosthetics, modern-day dentures are now smaller, sleeker, and more natural-looking than ever. Partial dentures can replace a few missing teeth while fitting in seamlessly with a patient’s remaining teeth, like the peace of a puzzle. Or, with a full denture, we can easily restore an entire row of teeth. Sometimes, a patient may have so many dental issues that a single procedure isn’t enough to fully restore their smile’s appearance and function. For these patients, we’re happy to offer a full-mouth reconstruction. This will involve a custom-made plan consisting of multiple restorative and cosmetic treatments intended to eliminate numerous dental problems and make a patient’s smile look just as good as it feels. Each one is specially designed for every patient, and with it, we can make even the most forgone smile shine brightly again. As we age, our body naturally changes, and this includes our smiles as well! 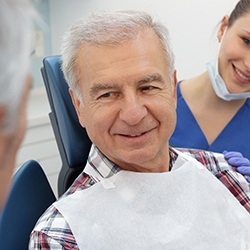 Dental care for Chaska’s wisest citizens requires a little bit of extra attention as missing teeth, old dental work, and different medications are all often at play. Thankfully, our team is well-equipped and has experience serving smiles of all ages, so for those in their golden years, we’re able to ensure that their smile stays healthy and strong throughout.